A joust is defined as a fight between mounted knights wearing armor and using lances. Watching Medieval Knights Jousting was a favorite form of entertainment during the Medieval times and era. Medieval Knights Jousting contests took place at Medieval tournaments which provided a venue for Knights to practise various forma of combat to the delight, and for the amusement, of crowds of onlookers. The tournaments kept the knight in excellent condition for the role he would need to play during medieval warfare - skill with weapons and supreme strength and fitness were necessary to knights of the Middle Ages. Tournaments were exciting and colorful pageants which displayed different forms of combat. Medieval Knights Jousting was one of the events shown at a tournament. Medieval Knights Jousting was an individual event whereas the Melee was a team event where teams of knights fought on fought or on horseback. 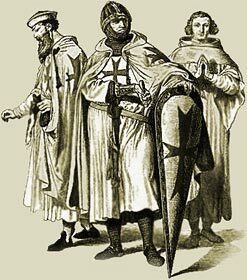 The Medieval Jousting Knights represented their liege lord or were entering the tournament in order to win the purse, or prize money. In early tournaments the losing knight would forfeit his armor and his horse which would be claimed by the victor. Fame and Glory were also good reasons for the Medieval Knights Jousting knights to enter a tournament. Pas d'armes or passage of arms Medieval Knights Jousting event - A Knight would send out a proclamation that he would take on all Medieval Knights Jousting challengers at a specific time and place. The origins of Medieval Knights Jousting can be traced to any war time in early history was dependent upon equestrian skills - for instance, the horsemanship of the Mongols was legendary. The Gladiatorial contests fought in the arena's built across Europe were banned in 404AD. But the battles fought in the arenas were remembered and changed into games to enable soldiers to practise skills which did not culminate in the death or injury of participants. Old games were revived where the battles of antiquity were replayed in those such as the 'Game of Troy'. The tournaments of the Middle Ages replaced the gladiatorial games of the Roman arena but with far less fatalities and bloodshed and far more finesse. The Code of Chivalry was an important element of the tournament and the Medieval Knights Jousting event. It is interesting to note that the word 'joust' is derived from the Roman 'juxtare', which means "to meet together". Click the link at the top of the page to discover the History of Medieval Knights Jousting. The Medieval Times website provides interesting facts, history and information about knights of old which scatter the Medieval History books including the subject of Medieval Knights Jousting. The Medieval Times Sitemap provides full details of all of the information and facts about the fascinating subject of the lives of the people who lived during the historical period of the Middle Ages. The content of this article on Medieval life and times provides free educational details, facts and information for reference and research for schools, colleges and homework for history courses and history coursework.